When you’re on the go, you don’t have time to be hindered by wrinkled clothes. When traveling, you need to be able to keep yourself just as neat and presentable as you would at home. Clothing often gets stuff inside your luggage, so wrinkles and creases are unavoidable. With a travel iron, you can keep your clothes ironed even when far from home. Having the best travel iron is important when you can’t easily find an alternative in a new location. Here we have conducted research on the best models to provide detailed travel iron reviews. Use this information to make a conscious decision and find a model that will meet your needs when away from home. 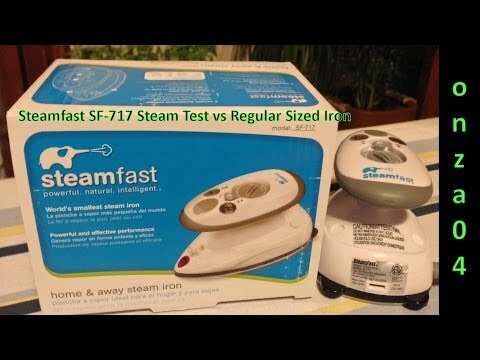 The Steam Fast SF-717 is a mini steam iron that can remove wrinkles from nearly any type of fabric, and its portability allows touch ups wherever you are with a variety of clothes. Due to its low weight of just one pound, you can bring the iron along with you when on vacation or other travels. The lightweight steam iron works well in removing wrinkles quickly so you can be on your way much sooner. It comes with a measuring cup for water filling and a heat-resistant travel bag. Cord Length The long cord allows you to easily move around your home or hotel room as you use the iron. Dual Voltage This allows you to use the iron in many different sockets around the world. Speed The SF-717 reaches the desired heat in as little as 15 seconds, and it has adjustable temperature settings. Non-Stick Surface The non-stick sole-plate helps resist sticking or damaging fabrics. The Hamilton Beach 10092 is a travel iron and steamer with a compact size and design that allows it to be used easily when traveling. Its dual voltage means it can be used in many locations around the world, and it features a stainless steel sole-plate that prevents clothes from sticking or burning. You can avoid looking disheveled while traveling or when taking pictures as this iron can handle all wrinkles that come as a result of leaving clothes bunched up in your luggage. Versatility The 10092 is capable of ironing a variety of fabrics. Compact Design The iron has a compact design with a folding handle. It weighs just 1.5 pounds, so it can be easily stored and carried. Stainless Steel The stainless steel sole-plate resists sticking, catching and burning fabrics. Dual Voltage The iron can be used in many locations worldwide. Fast Heating This model is ready to steam in under a minute, and it produces steam continuously once ready. The Sunbeam GCSBTR-100 travel iron can take the wrinkles out of many types of fabrics and materials. The lightweight iron removes lines and creases easily with its steam shot feature. Unlike many standard irons, the GCSBTR-100 doesn’t leave wet drops over your fabrics. It utilizes dual voltage to be used in many outlets around the world so you can travel with more convenience. There are various temperature settings available to accommodate the variety of your clothing and other fabrics. The Sunbeam GCSBTR-100 is a reliable iron that can be brought along on vacations and business trips. Lightweight The GCSBTR-100 is a lightweight model at just 1.2 pounds. Shot of Steam This feature is meant to help with the toughest wrinkles. Non-Stick Surface The non-stick sole-plate prevents sticking or catching of your clothes to reduce the chances of burning or tears. Comfort The handle and dial are soft to the touch. Versatility Variable temperature settings allow you to iron many types of materials. The Ivation travel iron is a 420-watt device that easily removes wrinkles from a variety of fabrics. Its 1-touch steam control and variable voltage allow total control and convenience when traveling. The compact iron features a non-stick ceramic sole-plate that prevents burning. The unit features three heat power levels with simple selection, and it has a comfortable handle for prolonged use. Even with a no-drip function, the portable travel iron is as functional as irons that are much larger and more expensive. No-Drip Design The travel iron has an innovative design that prevents dripping to avoid water stains and burns to the skin. Quick Heating The iron heats up in as little as 15 seconds. Variable Heat The Ivation model features 3 heat levels. Long Cord Despite its small size, this model features an extra-long power cord that wraps around the unit and clips in place. The Rowenta DA1560 compact steam iron is a 1000-watt model that can eliminate wrinkles and creases from nearly any fabric. The unit’s compact design allows it to be easily transformed into a travel iron that is easy to store and carry. Its convenience features include dual voltage to use in various locations as well as a folding handle for packing easily. The DA1560 has adjustable temperature settings as well as a micro-steam stainless steel sole-plate that prevents burning. You won’t have to worry about damaging your fabrics with this model, and you can take it along on vacation to look neat wherever you go. Steam Burst This feature helps remove the toughest wrinkles. Vertical Steam This allows you to use the unit as a steamer as well as a normal iron. Stainless Steel The sole-plate is made of stainless steel to prevent sticking and burning. Adjustable Temperature Settings Different settings allow you to iron tough and delicate materials. The Black & Decker X50 travel iron works well for traveling as it can be carried along easily in your luggage. It has a light and compact design with a comfortable handle that folds down to allow the iron to fit into even smaller spaces. Its dual voltage system makes it convenient to use all around the world, and it comes with a non-stick plate that prevents clothes from sticking or burning. Its variable steam control allows use with a greater range of fabrics and its push-button spray mist helps straighten tough wrinkles. Compact The lightweight and compact unit is a great portable iron for travel. Dual Voltage This allows you to use the iron in more locations around the world. Steam Its variable steam control and spray mist give you greater control over tough wrinkles. Water Tank The X50’s water reservoir is removable to facilitate filling and emptying. The Conair EZ Press is an 800-watt travel iron that is small enough to be taken on your travels but still functional enough to be used like a regular iron. It has the ability to remove wrinkles from an assortment of fabrics that may get thrown and squeezed in your luggage. It offers a steam burst function that helps with tough wrinkles, and it has a stainless steel plate that smooths clothes easily. You can use the iron for steaming or dry pressing. Its light and compact design makes it easy to carry along when traveling as it weighs just 1.6 pounds. Steam Burst This steam burst function helps to quickly remove tough wrinkles. Adjustable Temperature The range of temperature settings makes it easier for you to iron a variety of fabrics from tough to delicate. Stainless Steel Plate The stainless steel glides across many types of fabric without catching in their fibers. The IreVoor iron is an 800-watt miniature travel iron that is capable of removing wrinkles from nearly any type of fabric. The easy-to-use unit is well-balanced and lightweight, and its small size makes it much more convenient to take along on business trips or other travels. The IreVoor features quick-heating technology that speeds up operation along with indicator lights to inform you when the unit is ready to use. The miniature iron uses dual voltage so you can bring it along to a variety of destinations, and it features a built-in fuse and thermostat for added safety. Quick Heating The unit becomes hot enough to use in just seconds. Super-Compact The unit is particularly small even when compared to many other travel irons, so it can be carried along easily. Non-Stick The iron features a Teflon non-stick plate that glides smoothly over fabrics, and its pointed tip makes it easy to maneuver around tricky areas. The Sunbeam GCSBTR-100 Travel Pack offers the dependable GCSBTR-100 with twice as many units, so you can keep one and give one to a friend or family member or just have another one as backup. With the model’s small size, it should be easy to accommodate a spare iron in your luggage should you keep both. Your clothing will be smooth and free of wrinkles whether you perform light touch-ups or press deep grooves. The GCSBTR-100 provides the convenience of dual voltage that is perfect for travelers in addition to its compact design that makes it easy to carry along. Its non-stick plate helps it glide across fabric for quick and easy ironing. Non-Stick Sole-Plate This prevents scratching and allows the iron to slide over fabrics smoothly and effortlessly. Steam Shot This sudden burst of steam helps attack tougher wrinkles. Variable Temperature This allows you to use the iron on a wide selection of materials. Comfort The handle and dial are soft to the touch for enhanced comfort when gripping. The mini wax and travel iron from Demon is so compact and portable it can easily be placed in your luggage and carried from place to place. One of the best features of this iron is the fact that it has dual functionality. It can be used as a standard travel iron, but it’s also made to be a waxing iron for your sports equipment including snowboards and skis. It weighs just one pound and measures 9 x 8 x 4 inches, but it works well and is long-lasting. The Demon mini wax and travel iron comes with a warranty of one year. Very Compact The unit is small in size and weighs just a pound to be carried or stored easily. Having a portable iron handy when traveling is certainly convenient, but it doesn’t mean much if the device can’t perform well. You may be tempted to buy the most affordable option you can find to save money, but if this means compromising on power, you would be wise to look for something better. The main benefit of using a travel iron is the fact that you can plug it in even with other types of electrical outlets. The best travel iron comes standard with dual voltage capability. The main benefit of a portable steam iron is that it’s compact enough to carry around and small enough to fit in your luggage. You need a balance between function and size. You don’t want anything too bulky, but you also want to make sure the iron is big enough to get the job done. Obviously you don’t want to lug around a travel iron that weighs as much as yours back home. Just like the size, the weight of your iron needs to be in balance. The weight may determine the quality of the unit’s build, so you want an iron that’s heavy enough. Make sure you find a travel iron that produces steam. Most travel irons are equipped with steam capabilities, but some are not. The benefit of having a steam travel iron is that you can produce the same results on the go that you would receive from your iron at home. Having an iron with variable steam settings gives you greater control to properly iron clothing of different materials. You want to be able to get a smooth look for your garments, but you shouldn’t have to worry about accidentally burning them because you can’t adjust the heat. If you read any travel steam iron review, the one feature that will always be mentioned is the time it takes the iron to reach the desired heat. Travel irons are made to be used quickly when you’re busy on the move. The faster your iron can get hot, the faster you can be out the door. The hot surface of the iron plate helps loosen the fibers in the garment in order to produce a flat and straight look. Because the plate gets so hot, it’s at risk for sticking to certain clothing, especially if you use chemicals on your garments. To avoid this, find an iron with a non-stick surface. Because of their small size, most travel irons can be operated with just the palm of the hand. One of the factors repeatedly mentioned in travel iron reviews is how comfortable a device is to operate. A good iron should allow for a solid grip without causing cramps or discomfort. When in unfamiliar hotels or even foreign countries, it may be difficult to find an outlet that allows you to iron where you’d like. With a longer cord for your iron, you can move around more freely to iron in a comfortable position. At this point, you should have more than enough information to consider in order to find a quality travel iron. The best travel iron for another consumer may not be the best one for your circumstances, so you should take many factors into consideration before making the final purchase. Purchasing a travel iron will make a significant improvement in the way you handle your clothes and appearance when on the go. You should not expect to compromise just because you have to iron clothes somewhere away from your standard iron. In order to purchase the best travel steam iron for your needs, you must compare the models you like best and narrow them down to find one that matches well with what you expect from your appliance. This will involve doing research and comparing the best travel iron reviews to get a clearer picture of what each model has to offer. Once you’ve made your decision, get the iron you want to make your busy lifestyle that much easier.